For the McQueen line, creating surprising design combinations isn't just a passing whim, it's the driving force behind the brand. In this case, McQueen has collaged together two very different elements: a very royal looking jacquard with a very scary queen skull. And I can't get over how well it works. The fabric on this hard-cased clutch looks like a design you might find on a baroque tapestry. The silver and gold pattern is abstract, but still looks organic. It's also ornate and eye-catching, but muted enough to not be over-the-top. The rounded-off rectangular shape is the same as the rest of McQueen's skull clutch line, but it looks particularly appropriate here. The smooth, elegant shape is a great complement to the complex pattern of the fabric, and it takes a little (but not too much) edge off of the skull clasp. Speaking of the skull clasp, it's definitely my favorite so far. The gold skull with black jeweled eyes is wearing an elaborately intricate crown. This image is terrifying and elegant at the same time, a typically irreverent McQueen flourish. 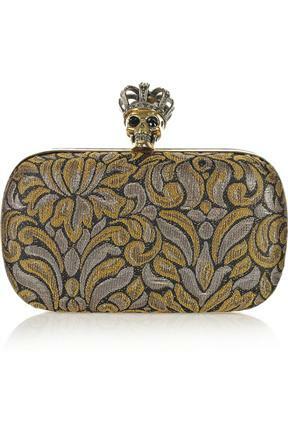 At $1,595, the Queen Skull clutch is well-priced for this designer's range, and you'd be hard pressed to find a more interesting evening bag. Or one with such dangerous good looks.